In 2003, my friends and I organized a forest defense campaign against a financial holding company called Maxxam We called the campaign Dirty South Earth First! (DSEF!). Maxxam were the owners of Pacific Lumber, a California based company that was rapidly clear-cutting Northern California’s redwoods for big profit. Maxxam had also hired private security goons that violently extracted tree-sitters non-violently defending those forests. In response, we aggressively targeted not just Maxxam, but individual executives in both their Houston offices and lavish homes. We quickly got the attention of Houston police, the company’s private security team and the federal government. Years later, through Freedom of Information Act (FOIA) requests (both mine and friends), I found out that the Federal Bureau of Investigation (FBI) had tracked my air travel, watched my home, listed me as an associate of a “criminal organization,” paid at least one fellow Houston activist to inform on us and most likely reported me to the Australian government while I traveled there resulting in my detention and forced removal from that country as a “national security threat.” Others in DSEF! had similar or worse experiences. Libyan oil production this month fell below 400,000 barrels per day—from 1.65 million bpd a year ago—as striking workers shut down export terminals. The Petroleum Facilities Guard (PFG) appealed to the Defense Ministry for military reinforcements after clashes at the Zueitina oil port Aug. 20. PFG chief Edris Abokhamada claimed that armed protesters at the facility “fired on civilians” after being asked to leave—apparently with no injuries. Clashes were also reported at the Brega terminal, and the Es Sider facility remains shut by worker occupations. The terminals are run by a partnership between Libya’s National Oil Corporation and majors Occidental Petroleum and Austria’s OMV. Libyan oil production has been interrupted repeatedly since the fall of Qaddafi by striking workers, unemployed youth, and political protesters. Charleston, W.Va. – This morning at 7:30 a.m. two activists paddled out onto the 2.8 billion gallon Shumate slurry impoundment in Raleigh County with banners reading, “Slurry Poisons Appalachia” and “Gov. Tomblin, Put Health Over Profit.” Later this morning, one activist locked himself to a barrel of black water in front of Gov. Tomblin’s mansion in a Tyvek suit reading “Locked to Dirty Water”. Activists are calling attention to the failure of the state government to protect its citizens from the abuses of the coal industry and the threats posed by coal slurry disposal. Folks from Great Plains Tar Sands Resistance will be doing presentations about the impact of tar sands development, transportation, and refining. We’ll tell stories about our experiences resisting the Keystone XL, discuss future tar sands projects in the area, and move forward collectively in our efforts to resist all forms of tar sands infrastructure. Seven activists locked down at the State Building on Aug, 5th, the 29th day of a California prisoner hunger strike. More than 30,000 prisoners are on hunger strike with 5 core demands. HOPE, B.C. — Another leak has been detected along Kinder Morgan’s Trans Mountain pipeline which crosses southern British Columbia carrying petroleum products from Alberta. Kinder Morgan spokesman Andy Galarnyk confirms the line has been shut down as a precaution after a company crew noticed a problem in the Hope area, about 150 kilometres east of Vancouver. Galarnyk says regulatory agencies and local authorities have been notified and the company is following the same procedures used on June 12 when a small leak occurred near Merritt, about 120 kilometres north of Hope. 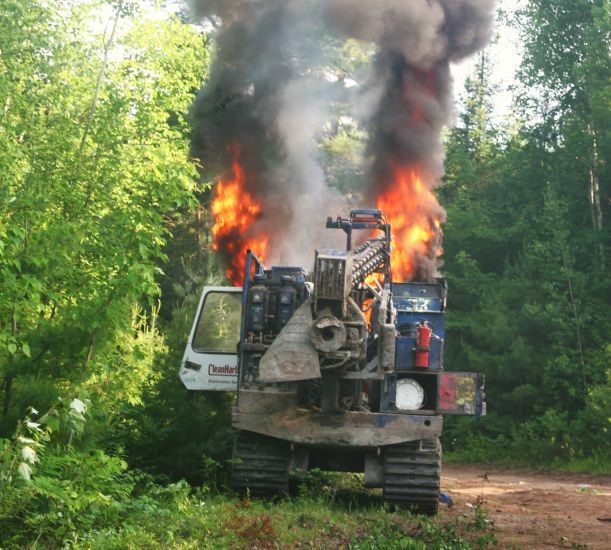 Halifax Media Co-op reports that a piece of drilling equipment was set ablaze on the 24th, by person or persons unknown. This comes amidst escalating resistance to hydraulic fracturing by indigenous peoples in Elsipogtog, “New Brunswick”. This comes after numerous direct actions, the midnight seizure of drilling equipment, and a local man being struck by a contractor’s vehicle.